Looking for the right app for your business? We've got you covered. You don't leave your office without your smartphone or tablet with you. Take advantage of the power of your mobile device to increase your productivity and get paid faster by creating and sending invoices while you're on the job site, after a client meeting or you have some down time while traveling. 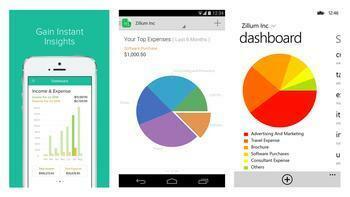 Use one of these five top mobile billing apps to track time and expenses, too. All of these apps have strong, bank level security for your data and they synch with low cost online billing and invoicing software in the cloud so you never lose your valuable information. Each of these online billing mobile apps is ranked highly by users, with Zoho Invoice and Freshbooks being rated highest. Download the apps from iTunes App Store or Google Play. 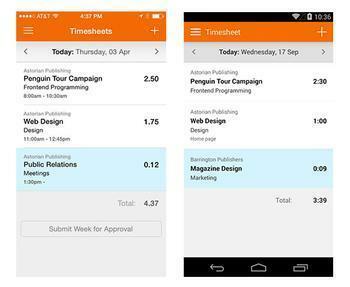 The Freshbooks mobile app has a crisp blue and white interface with a home screen with convenient one tap access to invoices, clients, time tracking and expenses. The tablet app looks especially impressive due to the additional screen real estate. If you find yourself in an area with no cell coverage or wifi, you can still use the Freshbooks app offline and data will sync with the online app as soon as your connection resumes. Send estimates and invoices to clients directly from your mobile device, and if you have the client in your contact list, their information will be pulled into the estimate or invoice. After you send an invoice, you'll be able to check the status to determine if the client has viewed it. 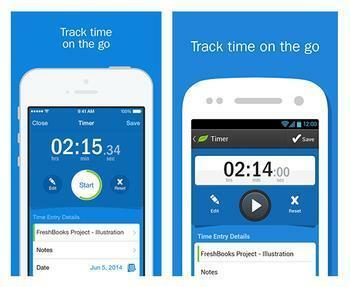 Track your hours for each project using the Freshbooks timer, which runs in the background on your phone or tablet. Billable time can be compared against budgets for each project, and time entries can be filtered so you can see what your colleagues have done. Team time sheets give you another view of what work has been done on a project. Documenting expenses is as easy as snapping a photo of a receipt, and expense receipts can be attached to invoices to pass the cost on to the client. Freshbooks for Android phones and tablets requires Android 2.3.3 or higher. The Freshbooks for iPhone or iPad requires iOS 7 or later. The mobile app is free. See my Freshbooks review for online app pricing and other information. 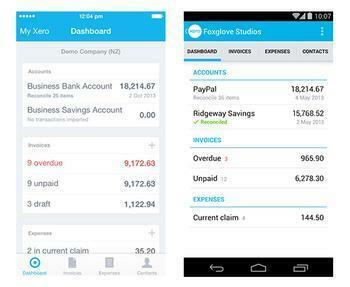 Xero for Android and iOS has a clean, uncluttered look that uses soft yet clear color throughout the app with red accents for calling attention to important details, like an overdue invoice. Xero has multiple currency support, something to consider if you have international clients. 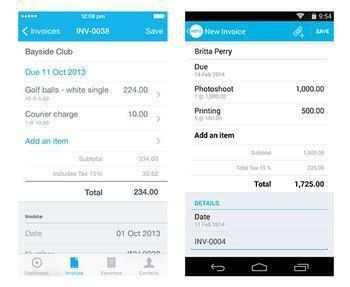 Use Xero to create and send invoices from your iPhone, iPad or Android phone or tablet, enter expenses and document them by snapping a photo of receipts with your devices's camera. The contact records feature the ability to keep notes on each customer and supplier and Xero will find customers and suppliers on a map, which is helpful when you're traveling to their offices. Along with invoicing features, the Xero app can also connect to bank accounts, credit card accounts and PayPal. Transactions are automatically downloaded for each account every night and you can reconcile the accounts on your phone while keeping up to date on account balances. Xero for iPhone or iPad requires iOS 6 or later. Requirements for Xero for Android are listed as depends on device. 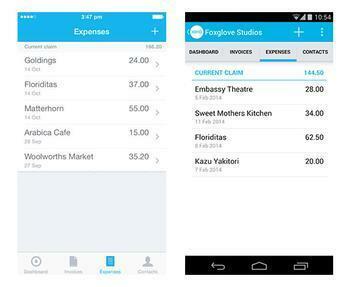 This mobile app is free, and an online Xero account is required. 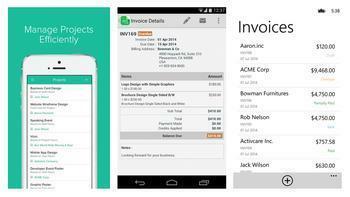 Open Zoho Invoice on your iOS or Android mobile device, and you'll see a dashboard with graphical reports that show current and overdue invoices, sales and expenses and other information. Estimates and invoices can be created easily using templates, then emailed, saved as a PDF or printed using Google Cloud Print. You can track the status of invoices and estimates and follow up with customers by sending them reminders from the app. When expenses are entered, they can be can be categorized (travel, supplies, etc. ), and you can snap a photo of receipts to attach to expenses. Zoho Invoice also has modules for time entries and a timer so you can accurately bill for your hourly rate work. Zoho Invoice supports multiple currencies and languages and can accept credit card payments. Zoho Invoice for iPhone or iPad requires iOS 7 or later. Zoho Invoice for Android phones and tablets requires Android 2.2 or later, and there's also a version for Windows Phones. 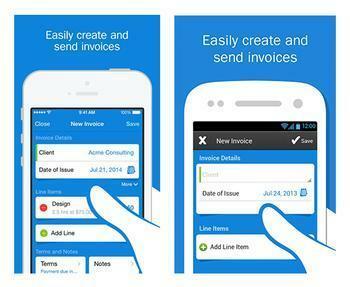 The app is free, but you'll need an account with Zoho Invoice online billing software. See my review for more information. 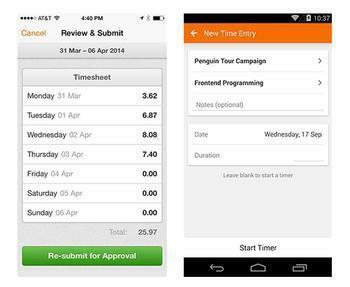 The Harvest mobile app has strong features for time tracking, expense logging and project tracking all presented on a very simple light gray and orange interface. While you can use the app for accumulating billing information like time spent on projects, you'll need to use the browser on your phone or tablet to set up and send invoices as well as to set up new customers or projects and view reports. Harvest tracks time spent on projects and on tasks while most other apps of this type only track project time. 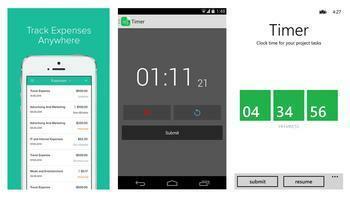 Tap a timer on and off to track your time accurately, or enter time in the Harvest app time sheets. Time entries work whether your mobile device has a connection or not. Enter mileage and expenses to be billed back to clients, and back up expenses with a photo of receipts. 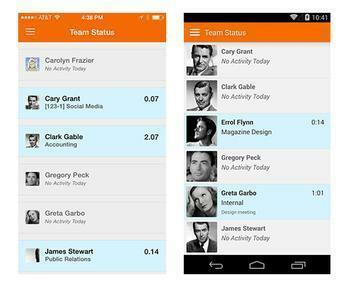 You can view notes that others on your team have entered for projects. If you're set up as an administrator on the account, you can view the timers of other teammates to see what they are working on real time. The Harvest mobile app is free and requires a subscription to Harvest's online billing software. Read my review for pricing and more information. Harvest for iPhone and iPad requires iOS 7 or later, and the Harvest Android app requires Android 4.0 or higher. QuickBooks Online for Android and iOS is a sophisticated yet very straight forward and easy to use billing app. 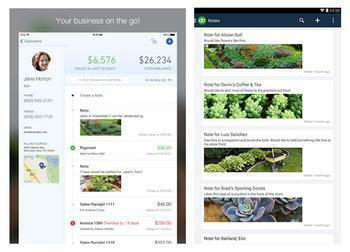 Create an estimate with the QuickBooks Online app, then convert it to an invoice with a couple of taps when the job is done. The invoices screen separates open, overdue and paid invoices which are represented as tiles showing the customer name, invoice number and date and the total. Tap on a tile to view the invoice details. Invoices can be emailed from the app, and you'll get an alert on your phone or tablet if a customer doesn't pay by the due date. Recent enhancements to the app allow for adding custom information to invoices, locations, service dates and transaction numbers. The app also creates receipts. 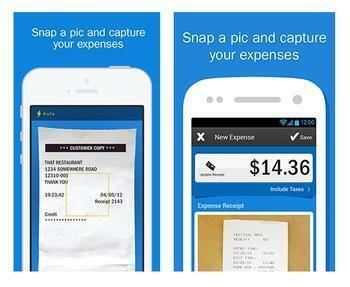 Enter and categorize expenses, and snap a photo of a receipt to document an expense. The expenses module shows a breakdown of expenses at a glance with a pie chart and more detailed information below the chart. In addition to billing and expenses, the Quicken Online app has a decent module for tracking customers. You can keep notes on customers with images, which is especially helpful if you work in a design business. Each customer record lists estimates, invoices, payments, notes and balance due. You can also call, email or find the customer location on a map with one tap in this module. With all that the QuickBooks Online app has to offer, it's missing one thing every other app on this list offers: a timer for project work. 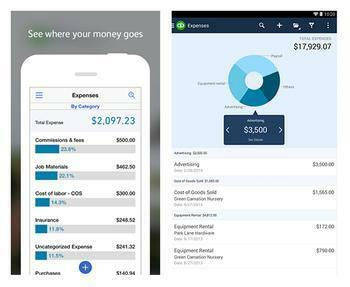 QuickBooks Online for Android mobile devices requires Android 4.0 or higher. The iPhone and iPad app requires iOS 7 or later. The app is free, but requires a Quicken Online subscription, which currently offers a free trial. Read my QuickBooks Online Simple Start review for pricing and details. How Safe Is That App Your Child Is Using?